Where did all the natural clouds go? And We Won't Take It Anymore! To whom it may concern. I have lived in Las Vegas, Nevada for over 18 years. I like the city very much. Some friends of mine who live in Utah, asked if I could help them out and help them get their house ready for sale. It was not kept up very well I might add. I have been here in Cedar City for about 7 months. Believe me, I sure do miss Las Vegas. I am almost done with what I could possibly help them with. I will be leaving to go home to Vegas in a few weeks. I have noticed that every other day or so, I have seen chemtrails in the skies over Cedar City, Ut. I cannot believe how many chemtrails I have seen since i've been here. I have seen as many as 40 or 50 a day at times. I am interested in aliens, underground bases, tunnels, etc., and have been for years. I also do a lot of research on these and other subjects. I don't have my camera with me, or I would have taken pictures of the chemtrails. Do you happen to know what this woman's email address is? I'd like to let her know that it's very common down this way... It will only get worse as summer approaches too. I've enjoyed your Utah page for some time now(a couple of years). I just moved to Eagle Mountain(EM) from South Florida. "sprayers on" just west of Eagle Mountain ( I assume that is roughly where Dugway is). I wish I had my camera that day. of Dugway and it's apparently right in my back yard. Today I saw some very strange circular round cloud patterns west of Eagle Mountain... it looked like someone turned on a giant electromagnetic switch. I will start taking lots of pictures ( already have lots of chemtrail pics). away at all. I live in EM Town Center just east of Cedar Fort. Please tell me how I can contribute. I am a rense.com addict as well as cyberspaceorbit.com and a huge fan of Clifford Carnicom and his chemtrail research. My eyes have been opened and I am pissed off at what our government is up to. I really like the sight it is great. I live in Utah found your sight. 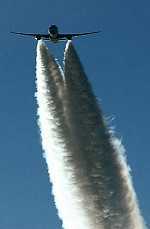 Because one day I noticed their were unusual amount of contrails over salt lake valley and all in a organized fashion. If you are interested I would be willing to send you the photos. .....Conor B. We went inside to get a smoke and when we got back outside, right over the house where the air craft had flown, we saw 2 large wispy like clouds that weren't very long in length. l There is plenty of pattern and precedent to suggest that clandestine biowarfare experiments are routinely practiced on the American public without their informed consent. Two Congressional investigations in1977 and 1994 - and recently declassified British defense documents - detail 50 years of "open air" testing that used ships and spray-equipped aircraft to spread biological warfare stimulants on hundreds of cities across the U.S., Canada and the U.K.
.l ....recently revised U.S. Code Title 50, Section 1520 states that the Secretary of Defense may conduct tests or experiments "involving the use of a chemical agent or biological agent on a civilian population" if they are related to research activity. The law also stipulates that biowarfare test can be carried out on Americans only if Congress is notified 30 days in advance, and "only if informed consent to the testing was obtained from each human subject in advance of the testing on that subject." Have you noticed all the chemtrails over Salt Lake this month!!!! 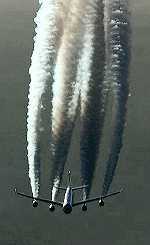 My business partner's mother pointed out the chem trails to me in the summer of 2002. Until my move to the bay area in January 2003, I watched them closely as they seem to appear daily over the valley. As I fly out of SLC often, I began watching to see when the trails began and ended. Strangely (or not), the trails had endpoints at the Oquirrh mountains to the west and the Wasatch front to the east. So, the excuse by gov/military/weather people that this is due to high altitude seems hollow (though it was already hollow), since they should stretch out somewhat randomly over all of Utah. Essentially, these trails appear purposefully laid over the only area of Utah that has significant population. After moving to the Bay area, I have watched the Chemtrails out here, too. As I live near Santa Cruz, I watch as they appear at the first signs of land and move inward. Though they crisscross the bay area, I have noticed they are not as extensive as they are in Utah during heaving criss crossing. l Last year, probably during the latter part of January, my co-worker and I were parked in a circle overlooking Salt Lake City from up behind the State Capitol. We had just commented on how may contrails were criss-crossing the sky. The trails were starting to become wider and indistinct along the edges. All at once, we noticed a very sharp black line coming from the area of a contrail, but didn't appear to just be a shadow of it. We watched it for over a minute and then it disappeared. We were talking about how weird it was, and that it went clear from the sky to the ground. We couldn't tell exactly where it was touching the ground, but seemed to be a little southeast of the city. The ironic thing was, we had a digital camera sitting on the seat between us, but in the excitement of watching this strange occurrence, we both forgot it was there! l FUTURE LOOK OF THE US?